When several leading poets of the black arts era weren't emulating and extending the spirit of Malcolm in their work, they regularly chased a steaming, powerful locomotive force called Trane. The jazz saxophonist John Coltrane was the most revered musician in black arts discourse, and next to Malcolm, Trane was celebrated more than any figure in African American poetry of the time period. Coltrane died in 1967, just as literary and cultural artists were establishing their movement. Poets and various other writers began to celebrate the saxophonist's expansive body of work, often interpreting and re-presenting his wordless music as revolutionary messages. Michael Harper's "Dear John, Dear Coltrane," Jayne Cortez's "How Long Has Trane Been Gone," A. B. Spellman's “Did John Coltrane’s Music Kill Him," and Keorapetse Kgositsile's "Acknowledgment" all celebrated Trane. Haki Madhubtui's Don't Cry, Scream" and Sonia Sanchez's "a/coltrane/poem” were two of the more well-known Coltrane poems as they sought to re-present the musician's signature screeches and screams. 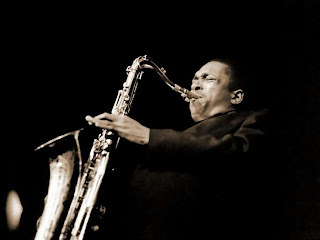 Quincy Troupe's "Ode to John Coltrane" was one of the more extensive and powerful poems in the field of Trane poems. Troupe manages to trace Coltrane's life and music in the poem, and at the same time, he turns a tribute to a single musician into an opportunity to highlight significant moments and ideas in African American cultural history. Trane served as an important subject for poets, but the late musician's efforts to produce new, powerful, and distinct sounds were also important models for a group of artists who were also trying to produce bodies of work that would have those qualities of newness, force, and originality.